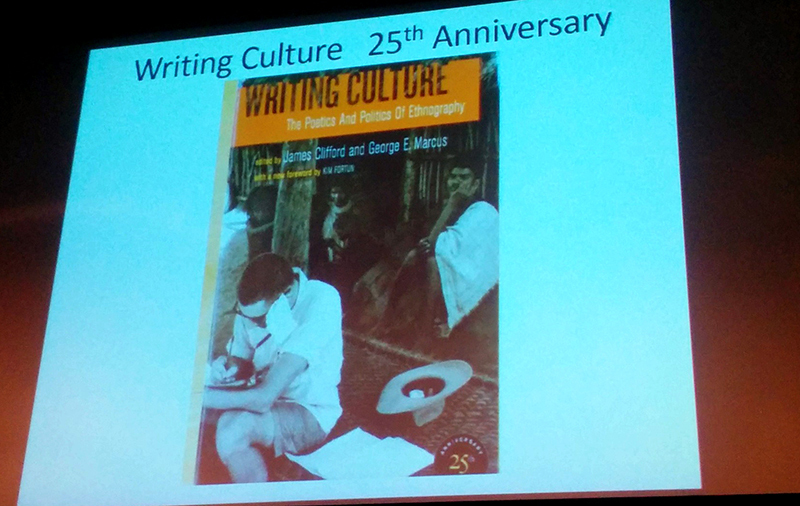 The 25th anniversary of his book Writing Culture was both an occasion and assessment of new directions for ethnography. 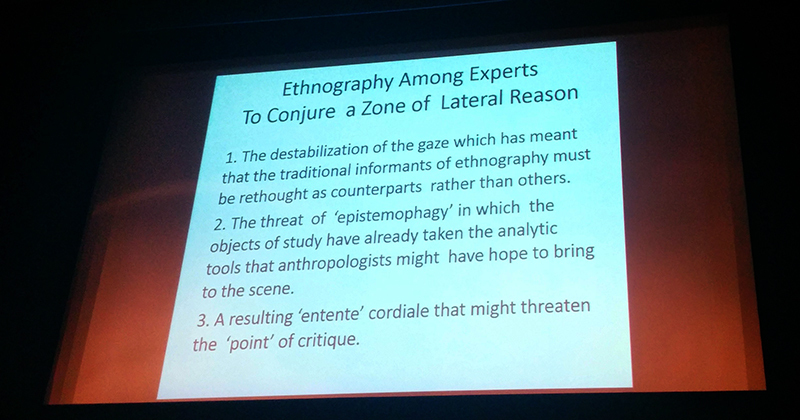 I attended the George Marcus talk Ethnography Inquiry Today to learn what was happening in ethnography academic circles. As someone who practices design research/corporate ethnography I thought I might learn a thing or two so was surprised that the talk ended up being about art – my first love and field and study. The history of ethnography in anthropology. Ethnography as an experimental discipline. Ethnography as a deeply humanistic scientific enquiry. Ethnography shifting its relationships over time from having objects of study to subjects of study to subjects becoming participants. Ethnographic writing needing to evolve to become a collaborative staging of ideas. Despite his own incredibly dense and academic language during the presentation he argued against “beautiful texts” as outcomes of study in favour of acts that were immersive and collaborative. 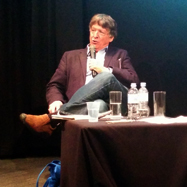 He argued that because ethnography sparks ethical debates that are often the first drafts of new social concepts that forums should be created as a result of studies that enable an audience to ask new questions. It’s a interesting shift away from knowledge “docked in points of authority” as Marcus put it. Drawing on the work of art historian Claire Bishop who writes about participatory art and spectatorship Marcus staged his findings as a reception of ideas and insights. What does this mean for Design Thinking and User Centred Design? 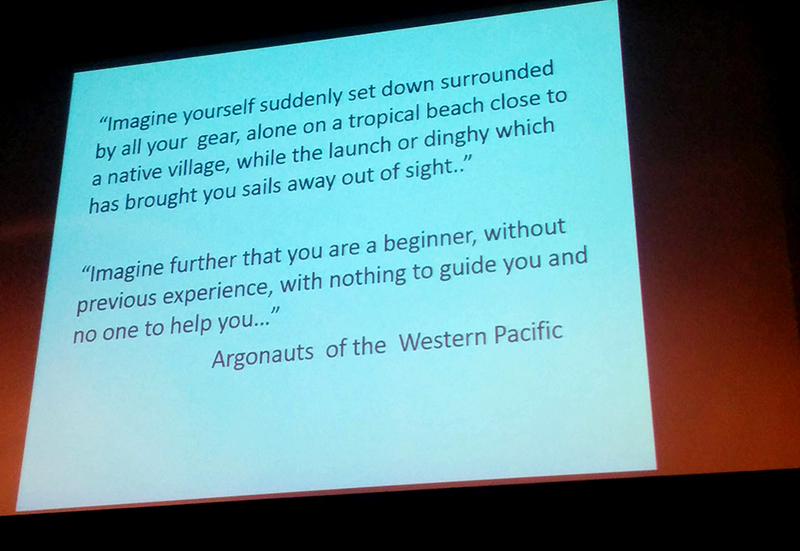 This talk did provoke me to reflect on projects past and that often ambiguous research discovery phase of a project. As design researchers and Design Thinkers we often conduct stakeholder and field research. Sometimes depending on the project or the consultancy this research is presented as a distinct phase with set recommendations suggesting the activities that will define new and better experiences, services and interfaces. We even sometimes offer criticism of our clients. We get to hear from stakeholders and we get to juggle their disparate views. But how often do we pose what we find out about them, their organisation, and their customers as questions? By positioning ourselves as experts do we risk competing with our clients who ultimately hold the domain knowledge and can take or leave what we have told them any way they like? Do we risk being positioned as management consultants providing assessments rather than as designers who are there to create and facilitate new experiences and visions? I’m in a lucky position that my role already defines clients as collaborators. While I don’t think I will revisit my roots as an artist and stage art events for design field research findings I do think that I will try to pose findings as questions. Hopefully to be answered by both customers and product owners along the way.